You can help raise money for LOFT with some retail therapy! If you shop online, you can raise money for LOFT just buy visiting Easyfundraising and clicking on the link to your normal retailers - or even find new places to shop! From the original print run of 100 XL size t-shirts, a number of these t-shirts remain available for just �99 each plus �p&p to anywhere in the UK. Professionally silkscreen-printed on high quality white t-shirts, they are in mint-condition and in their original wrappers, having been stored safely in a dark cupboard for the last 12 years! Only XL size is available, no print runs of any size will be made again, so these are genuinely a Limited Edition. If you have any queries, wish to enquire about postage outside the UK on items sold on this page, or want to talk to us about retailer partnerships to support LOFT's fundraising, please e-mail the Webmaster. LOFT is not responsible for the content of external websites. 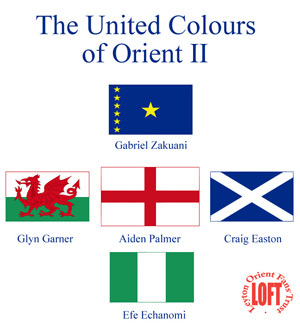 The United Colours of Orient II t-shirt design is � LOFT and was designed by Jonathan Kaye, based on the original 'United Colours of Orient' t-shirt design by David Prowse.